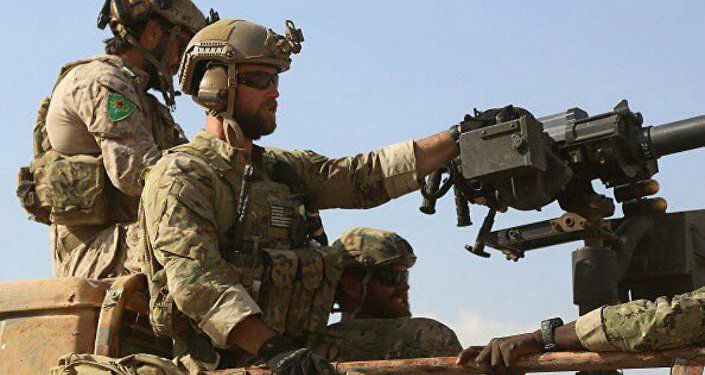 US President Donald Trump revealed to officials Wednesday that he wants to get US troops out of Syria relatively soon, but that they would have to stay a little longer to help fully defeat Daesh there. POTUS stated in a Tuesday meeting at the White House that he wanted to immediately withdraw US forces from the war-torn country, arguing that the US had already won the battle against the terrorist group. "I want to get out — I want to bring our troops back home," Trump said during his meeting with leaders of several Baltic nations. "It's time. We were very successful against ISIS." ​Speaking to Radio Sputnik's Loud & Clear, Peter Ford, former British ambassador to Syria, said that Trump's eagerness to withdraw US troops doesn't mean the process will be easy. "I have a feeling that there are divided counsels within the Pentagon, definitely in the White House [regarding the troop removal]," Ford told show hosts Brian Becker and John Kiriakou. "Trump sincerely wants to get out since it's what he campaigned on, but whether he'll be allowed to by elements of the deep state is the question." Trump is not, however, alone in his desire to get the US out. "I sense that some within the Pentagon aren't necessarily happy about lingering in Syria without a clear objective. The military love a clear objective… but a mixed mission, the military don't like," Ford said, before noting that the situation in Washington, DC, is "very messy." And while US hawks might try to trade an early withdrawal for a role in rebuilding the country, this wouldn't be a winning plan, Ford commented. "This would be a reasoning from the [war] hawks, [but] even if the United States hangs on in Syria, they're not going to be able to bargain away their departure for something else," Ford explained. "It's not like [Syrian President Bashar] Assad is going to stand down so it can get rid of 2,000 US troops… Iran is not going to up the stakes just to get rid of US troops." "This justification is very weak," Ford concluded.